EB member Captain Braunsfeld shared his custom British mortars for his Royal Horse Artillery. They are of excellent and sound design, and feature some very nice custom made figures and accessories! Stop by the forum and comment on British Mortars by Captain Braunsfeld! Master ship builder Admiral Bejaune had shared with us his simple design for making carronades. It uses few pieces, and would look great on the decks of your next ship MOC. Stop by the forum and check out this Simple Carronade! Notice the clever use of black hoses? This may be a small MOC, but upon closer inspection it's a very clever and detailed piece of work. Eurobricks member Mr. Townsend did a marvellous job on this powerful short-range cannon. This weapon caused even more deadly splinters on enemy ships, hence it's nickname the smasher. A great addition to many a LEGO ship! Sponge, wormer, bucket and cannonballs, it's all there! Discuss Carronade by Mr. Townsend in the forum. Morthen's Golden Whale shows off a brilliant gold and red color scheme. However this vessel isn't just nice to look at, but it also features working remote controlled cannons! Perfect for taking on Pirates who are up for a watery battle. Be sure to check out the video in the forum of the cannons in action. Fire at will, and then discuss the Golden Whale in the forum. Possibilities of firing over a hundred times in a minute! Eurobricks member Sebeus Iniwum surprises us again with a very interesting concept: firing a full broadside on a LEGO ship with a remote control. The project is still in its early stages but it looks very promising. Currently there's a discussion about the possibilities, problems and future ideas. Check out IR Broadside cannons by Sebeus Iniwum in the forum. Portable, lightweight, maybe even bite-size! Sometimes a full sized cannon is just too big. When you need a portable yet power packing blow. Look no further than TazManiac's little cannon. With a clever use of a little weightlifting material, He has managed to make a smaller version of the Pirate classic. Comment on this little cannon in the Forum! For his entry into the Community Build 2010 Eurobricks member Exotrator made this Cannon Foundry! It has everything in it what you need to produce cannons, an oven, a lot of tools and even an administration office! With an outstanding roof technique he makes this building very special. Make sure to check out the Cannon Foundry by Exotrator in the forum! Ready.....Set.... Fire! What happens if you mix a cannon with a crocodile? 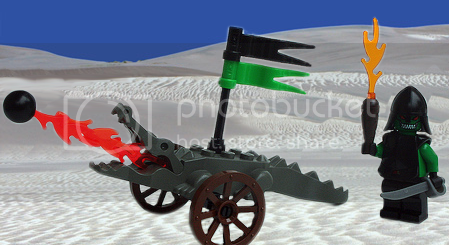 A croc cannon! A very humorous and creative MOC is brought to us by Rocko on Flickr. Want to give your opinion? Rush down to the forum to discuss this MOC! Can you supersize my Cannon Battle? Click to discuss Erdbeereis' Super Sized Cannon Battle in the Pirate Forum! Posted by Sea Eagle in Cannons | Comments Off on Can you supersize my Cannon Battle?